A stress ball is a malleable toy, usually not more than 7 cm in diameter, which is squeezed in the hand and manipulated by the fingers, ostensibly to relieve stress and muscle tension or to exercise the muscles of the hand. Despite the name, many stress balls are not spherical. Some are molded in amusing shapes, and pad- or transfer-printed with corporate logos. They are presented to employees and clients of companies as promotional gifts. Stress balls are the third most popular promotional gift in the United Kingdom. Because of the many non-spherical shapes now available, stress balls are generically known as stress relievers. Decreasing stress and tension can help to improve the quality of your life by promoting better sleep, warding off illness and enhancing a general feeling of well-being. Squeezing the ball activates the muscles of your hand and wrist; releasing the grip allows the muscles to relax. The repeated pattern of grip and release helps to alleviate tension and stress. The muscles in your hands and wrist can become weak from numerous conditions, such as overuse, arthritis or a fracture or sprain. 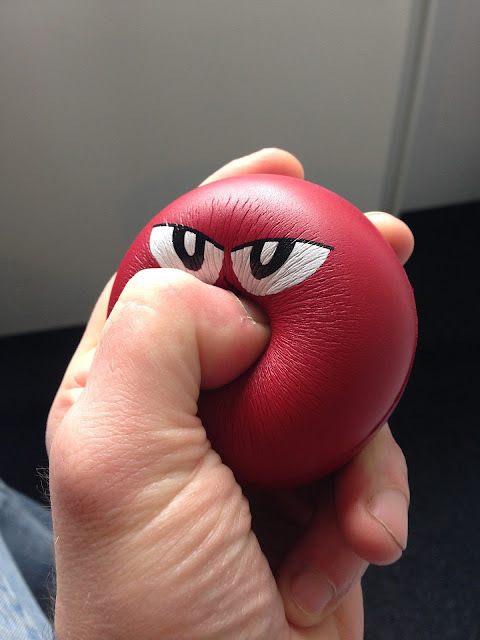 Squeezing a stress ball can help to rehabilitate and strengthen your hand. Hold the ball in the palm of your hand and squeeze it as tight as possible; hold the grip for five seconds and release. Repeat 10 times.